In honor of San Francisco’s delightfully naughty 420 culture, we present these, um, “green” cookies for your enjoyment. Of course, there is a little “something special” in this recipe that we simply cannot suggest a source for, so we’ll defer to your cleverness to sort that out. We appreciate that writing about baking pot cookies may be too personally revealing, even shocking, to some. But those who know and love us best will not be surprised by the following recipe. These cookies get much of their nutty character from the herb at issue. That will come as a surprise to some, but in this recipe, we’ve used the “spent” herb from a vaporizer which leaves us with a brown but not burnt byproduct that we cheerfully save for this recipe. The toasted weed is less potent than the green stuff, but it contains enough of the good stuff to do the trick. So even though it’s a little late to whip up a batch of these cookies to celebrate 420, it’s not too late to start saving your toasted herb for next year’s celebration. These cookies have been made using both an all butter recipe, as well as a mix of butter and coconut oil; light or brown sugars; and half all purpose flour along with other non traditional flours (barley, graham, whole wheat, etc.). They’re very adaptable. In a small slow cooker, steep the butter and “spent” weed about 4-6 hours (we usually do this overnight and just unplug after a few hours of sleep). Strain through a mesh strainer lined with cheesecloth and gently squeeze. Add the melted butter to a mixing bowl along with the brown sugar and salt, mix until all the lumps are out, 2-3 minutes, stopping the mixer and scraping down the bowl when needed. In a mixing bowl, add the all-purpose flour, baking soda, and baking powder. Briefly whisk together and set aside. When all the lumps are out of the brown sugar, lower the mixer speed and add the egg, egg yolk and vanilla. Scrape the bowl again. With the mixer on low speed, gradually add the flour 1/4 to a 1/2 cup at a time. Mix until well incorporated, scraping the bowl as needed. Scrape off the beater and cover the bowl with plastic wrap. Refrigerate for at least 30 minutes before proceeding. When the dough is firm, use a small sized ice-cream scoop to form balls of dough, about .75 ounce. Place scooped dough onto a parchment lined baking sheet as you work. Gently roll each of the cookie dough scoops between your hands to form smooth, round dough balls. Cover the cookies with plastic wrap and place the sheet in the freezer for at least 10 minutes or until dough balls are completely firm. The cookie balls can be stored in a plastic bag in the freezer for 6 months or more. To get baked: Preheat oven to 325 degrees (we’re keen on the Breville Toaster Oven for baking just a couple at a time). On a parchment lined baking sheet, place frozen cookie balls in a single layer, leaving about an inch between each ball. Bake for about 10-12 minutes, or until just crisp on the edge and soft in the center. A mélange of veggies (carrots, turnips, and butternut squash) prepare for the heat. The concept is simple; crank the oven up to a high temperature (around 425 degrees), take your favorite hard, non-leafy, vegetable and break apart or dice into large cubes (one inch? ), line a baking sheet with foil and place the veggies on the sheet along with a good drizzle of olive oil, roast for 20-30 minutes or until a nice roasted color has developed, remove from the oven and toss the veggies with salt, pepper, and whatever else you think might be good from your fridge or pantry. What you have is a delicious side dish to serve to the pickiest vegetable eaters. Don’t believe us about picky vegetable eaters? We took a couple of heads of cauliflower and roasted them for Steve’s parents over the holidays. Just a little salt and pepper added to the fresh-from-the-oven crucifers, and another drizzle of olive oil, was all it took for these two devout carnivores to enjoy a vegetable they normally don’t eat. If you’re looking to get kids to eat their veggies, asked them to help out in the kitchen. After washing the cauliflower ask your little ones to break apart the cauliflower and place it on the baking sheet. Let them do the work. When kids feel like they’re a part of the cooking they’re more apt to eat what they’ve prepared. 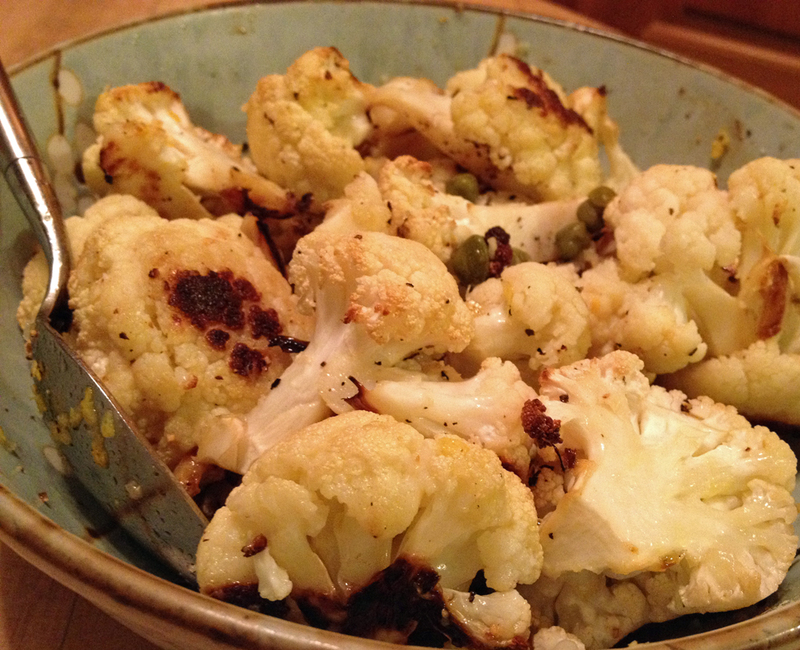 A bowl of roasted cauliflower with capers, lemon zest and juice. The roasting of the veggies brings out a deep rich flavor and sweetness that pan frying or blanching looses. Great veggies to try include broccoli, sweet potatoes, cabbage, Brussels sprouts, and, of course, the notorious russet potato. We use this technique with hard squash and beets in addition to the veggies already mentioned. An added benefit to cranking up the oven is the warming effect the ambient heat has in a small, freezing apartment. The basic recipe idea is outlined in the first paragraph, but for those of you who need an actual recipe, well here it is. Roast as much or as little as you want. Just make sure that all vegetable pieces rest in a single layer and that you don’t over crowd the pans. The heat needs to hit as much of the surface of the vegetables as possible (caramelizes the veggies and makes for quick cooking time). 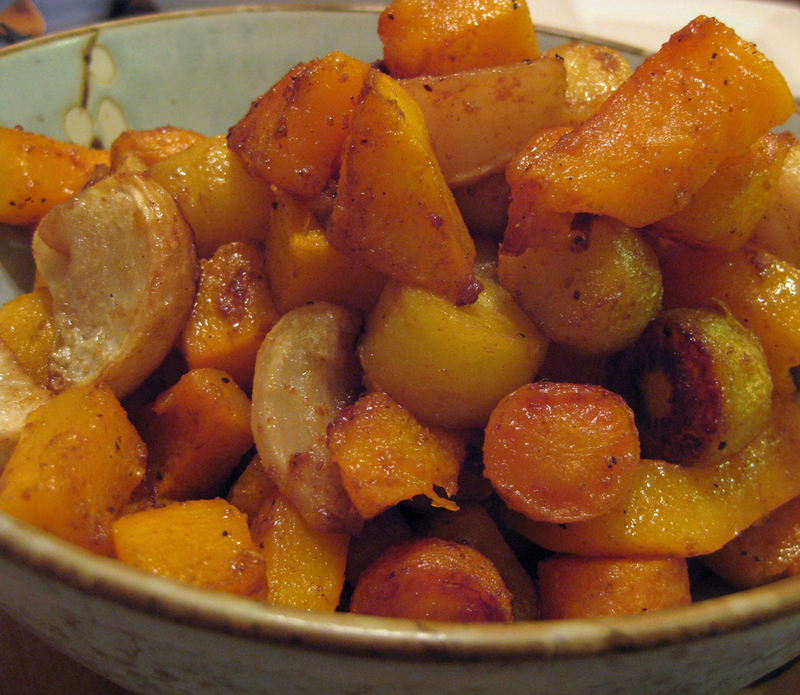 Carrots, butternut squash, and turnips with honey, garam masala, and curry powder. Hard vegetables such as; cauliflower, broccoli, sweet potatoes, russet potatoes, hard winter squashes, etc. Preheat the oven to 425 degrees. For easy clean up, line baking sheet(s) with aluminum foil. Large dice or break apart (broccoli and cauliflower) the vegetables. Place the veggies on the lined baking sheets and drizzle with olive oil (about 2 tablespoons per sheet). Roast in the oven for 20-30 minutes or until a good roasted color has developed. Rotate the pans and toss the vegetables half way through roasting. Once the vegetables are done, transfer into a bowl and add your optional ingredients. Enjoy! Other optional ingredients: garlic, red pepper flakes, peanut butter, lemon juice, vinegar, capers, anchovies, or whatever your heart, and stomach, desires. Garlic, red pepper flakes, & peanut butter: Add mince garlic to a bowl with the red pepper flakes and ¼-1/2 cup peanut butter. Add 1-4 tablespoons hot water and stir until a smooth consistency develops. Pour over roasted vegetables and serve with rice or noodles. Capers, anchovies & vinegar: After the vegetables have roasted. Add 1-2 tablespoons capers, 1 or 2 finely minced anchovies and a light drizzle of your favorite vinegar to the veggies. This is especially good with cauliflower. Garam Masala, curry, & honey: Toss the veggies with ½ tablespoon (or more) of each spice and about 2 tablespoons honey, along with olive oil, and salt and pepper. *Italian dressing: Substitute half the olive oil with a good quality Italian dressing before placing in the oven, or add the dressing to the roasted vegetables after they have roasted.